CARLSBAD — After City Treasurer Jim Comstock’s resignation, City Council agreed at its Feb. 12 meeting to accept applications to fill the position until his term expires in November 2014.Comstock left the position officially on Jan. 30, later citing personal reasons for his departure. He was elected in November 2010 for the part-time position, which pays $1,070 per month along with a car allowance. John O’Reilly was Comstock’s only opponent in the election, and lost after earning only 35.2 percent of the vote. City Council can call a special election or appoint an applicant within 60 days. Qualified applicants must be a registered voter living in Carlsbad, have a degree in finance or business, and have four years of financial work experience. 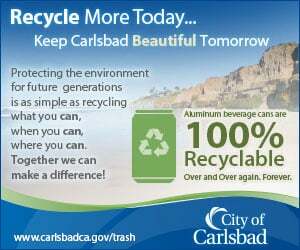 Applications are available at the city clerk’s office or at the city’s website at carlsbadca.gov. At its meeting, City Council also unanimously approved the installation of two stop signs on Magnolia Avenue, two stop signs on Esfera Street, and seven stop signs on Levante Street in an attempt to prevent speeding. The ordinance will take effect March 12 and the signs will be installed shortly afterwards, said Bryan Jones, deputy director of Carlsbad’s Transportation Department. City Council also adopted a new ordinance that bans parking of oversized vehicles, including recreational vehicles, boats, and trailers, on public streets between 2 and 5 a.m.